This is the first of a three part series on authentic listening, theater companies who do it, and how empathy can change the way we interact with our audience and other artists. Before the Thanksgiving holiday, I had the opportunity to attend Digital Hollywood, a two day conference where executives and experts at entertainment companies discuss the state of digital entertainment and marketing. I only attended the first day, but my experience was extreme. The panels either focused on large corporations, like Barnes and Nobel, sharing over-arching strategies to “extend their brands,” or they offered small businesses speaking intimately about innovation with the audience. One of the best panels of the day was The New Fandom: Building and Nurturing Communities. Its moderator, Steve Bradbury (@stevbrad), Chief Revenue Officer of Zazoom, took a refreshing approach to a well worn form. Instead of asking a prepared set of questions agreed upon by the panel, he dropped a bunch of statements into Power Point and asked panelists to give the number for a random statement about the industry. Steve then revealed a statement, like, “Brands are becoming more challenged to control their messaging vs. the will of their online community. Agree/Disagree?” Then, the panelists would chime in and expound upon their agreements or disagreements with each statement. 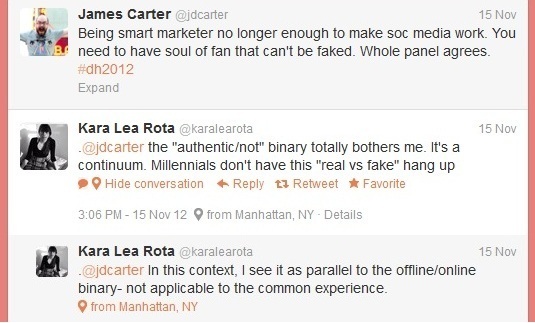 Kara’s points stuck with me, and I’ve increasingly been pondering this offline/online binary conundrum. The language we use to talk about our experiences is important, and frankly, it was the first time I’d considered that the offline/online binary might not be applicable to the common experience. We know it. We feel it. We are already there, yet there’s still insistence on separation. There is no offline/online binary. There is only living. There are only gathering spaces. The mechanics of those spaces – whether Twitter or a tavern – are different, but separating the spaces as though they are different alienates. It is not IRL (In Real Life) or VR (Virtual Reality). It’s all just life. One recurrent comment made throughout the day by several 40-something executives on Digital Hollywood panels was how they marvel at their children who play on iPads starting as young as age two. They wonder how this behavior affects their children’s impressionable minds. Ironically, this binary offline/online contextualizing keeps them from seeing something more intimate than their children. They don’t see how they, themselves, relate to the population at large. The weekend before Digital Hollywood, another conference, Futures of Entertainment 6 at the Comparative Media Studies Program at MIT, took place. I wasn’t able to attend, but the conference recently uploaded videos of the panels. One that struck me was the introduction to the second day of the conference with Mike Monello (@mikemonello), Partner and CCO of Campfire, and Xiaochang Li (@xiaochang), a cultural theorist and researcher. It’s about 20 minutes, and I encourage you to watch it for context, but in a nutshell, they encourage us to look at whatever the audience encounters and approach story creation like an architect. MIT TechTV – FoE6 Day 2 Opening Remarks – Xiaochang Li and Mike Monello. Mike compares the current culture to a Greek theater: “It’s designed so the audience can see each other as well as the stage.” He shared an architectural urban legend in which an architect of a college campus refused to create a design with sidewalks. He just planted grass, and wherever the students walked and wore a path, that’s where he made the sidewalks. Part of this architecture is digital. Part is in-person, face to face interactions. But, to separate the two as not intertwined creates an architecture that doesn’t listen to actions of the audience. It’s a dense charge, but basically, they encourage us to listen to the audience, which is a challenge for many art makers, especially in the theater. Tomorrow, I continue this three part series on authentic listening, sharing how theater companies like Vampire Cowboys, Gideon Productions, terraNOVA Collective and Flux Theatre Ensemble embrace their inner geeks to become the heroes the theater industry desperately needs. Great stuff JD! I find the conclusion to your article particularly true. It is a challenge for many art makers especially in the theater world to listen to the audience. I was asked out for drinks out of the blue with a friend (a filmmaker) last night who I hadn’t seen in a while. I realized quickly the purpose of our meeting was actually attempt to enlist my help with his so-called “lack of social media understanding”. The help he wanted however was not a list of what social media sites to join, or what content to share in 140 characters. His interest was instead to pay someone else (me) to do the social media work for him. I tried to explain to him that social media is not as easy as just paying someone else to do. Connecting with the online world as an artist must in some way start with you. There is NO one else that is as invested in your success as you are. And unless you have the budget to pay someone full time to do it for you it is impossible to keep up with on a part time level; His offer of what he was willing to pay was funny to me – future profit sharing. The model many broke artists work on out of necessity. Thanks but I know how those things go, this isn’t my first rodeo. Social media is like a garden, it takes work and dedication to grow your web of connectivity. Part of the work is to actively participate and engage with other people’s work the way you want them to engage with yours. It cannot be all ME ME ME. I realize this observation is more on a base level than the more advanced level “online/offline binary barrier”, but I think it goes back to your point of what is also a fundamentally simple but overlooked requirement for successful participation with the social media landscape as it is today – and that is listening is as important if not more so than what you have to say. Many theaters and their artists are like my friend the filmmaker. They only call you when they want something and are too busy talking about how great and important what they are doing is to realize you are no longer paying attention to them. I look forward to part 2, JD!!! Nick – First, it’s great to hear from you. I hope you’re swell. Thanks for reading and your thoughts. You’re spot on about how to approach social media, and the garden metaphor is great. I’d say – to expound upon breaking the offline/online binary barrier – it’s *all* a garden. From the fundraising, to the marketing, to the audience development, you’ve got to tend the entire garden. I’ll go more into that in Part 2, but basically, you have to walk the walk, talk the talk, and do it in a very personal way. Whether it’s the director of the company or a staff member making those connections, it should come from within. Sure, you can hire someone to do those things, but they need to be part of the team, not just an after thought. And, you certainly shouldn’t hire someone by dangling a carrot like “profit-sharing” as an incentive. In the arts, that’s more often than not bull hockey. Sam, it’s certainly easier to listen when a company is small and focused. In part two of this series, the theater companies I cite are like start ups: dedicated, passionate and scrappy. They offer intimate dynamic large businesses often can’t replicate. I hear executives of Fortune 500 companies telling their employees to “think like a start up.” I’m not sure if they know what that actually means, but the ones who do transform big business in a fantastic fashion. Mike’s examples of Nike and Red Bull living in the cultures they hope to cultivate are perfect ones of large companies taking on smaller, start-up-like interactions with their fans. Incidentally, my colleague Carrie Cutforth-Young, who is currently orchestrating the serialized Wattpad extension of The Karada, “All Your Fates,” mentioned how she’s noticing a late afternoon (after school) spike in traffic on this young adult, science fiction tale. It reminded me of your “As the World Turns” example. She’s crunching data, but she’s also listening to the audience. That drives how and when her team releases content. Listening may be messy, but so is creativity. Both are the life blood of strong companies. Take the time to be messy, and then implement logic and risk to make strong decisions that sustain the company for years, not just quarter to quarter.